70 years ago tonight, Pop Maloney was listening to "Uncle Tim's Barn Dance" on the radio station VOCM at his boarding house in St. John’s. Suddenly the live broadcast was interrupted by the sounds of panic. Someone shouted “Fire” and pandemonium ensued. Pop says he rushed down to the Knights of Columbus Leave Centre on Harvey Road and witnessed the nightmare of hundreds of people trying to escape from the building. It was wartime; many of the windows were boarded over. The Christmas decorations fueled the fire. 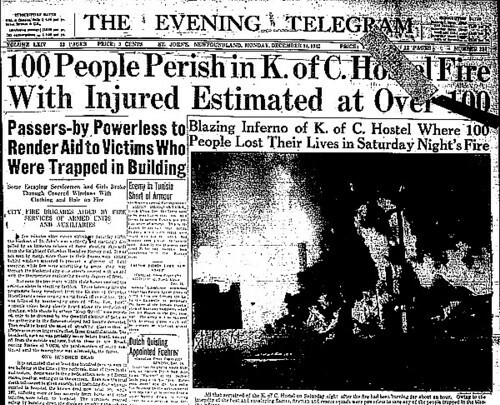 The building quickly burned to the ground claiming 99 lives. 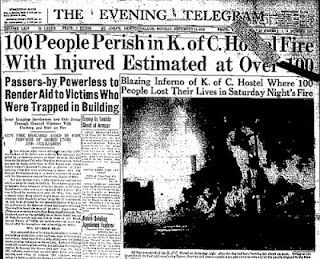 Tonight, The Knights of Columbus will hold a vigil recognizing the 70th anniversary of the horrible fire. The vigil will begin at 11:00 at the granite memorial commemorating those who died in the fire. 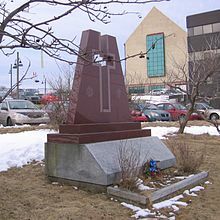 The memorial is located at the top of the old steps of the Knights of Columbus Leave Centre across the road from the Tim Horton’s on Harvey Road.